Mobile apps are software applications designed to run on smartphones, tablets and other mobile devices. They are typically available through app stores which are operated by the owners of the mobile operating system. By 2020, mobile apps are forecast to generate around 189 billion U.S. dollars in revenues via app stores and in-app advertising. Some of the most popular operating system-native stores are Apple's App Store, Google Play, as well as Windows Phone Store and BlackBerry App World. As of March 2017, there were 2.8 million available apps at Google Play Store and 2.2 million apps available in the Apple’s App Store, the two leading app stores in the world. Whereas mobile apps were originally offered as productivity and information retrieval tools such as calendars, e-mail and weather information, the market has rapidly expanded due to users’ demand and availability of developer tools. The most popular app category among Apple iOS users is utilities, followed by social networking, photo and video and games. Tools, communication, video players and edit, travel and local are the leading Android app categories in the world. In the United States, mobile users spent the majority of their digital time – which varies greatly according to their age group – with mobile music apps. Instant messaging apps are the second most popular mobile app category in the U.S. Indeed, mobile messenger and social apps have experienced a surge in popularity not only in the United States, but also worldwide. WhatsApp, the leading mobile messaging app in the world, has 1.2 billion monthly active users as of 2017. Many of the most popular mobile properties are mainly accessed via mobile apps instead of mobile browsers. Popular examples are mobile social networking apps, led by Facebook with over 1.1 billion monthly active mobile-only users. Facebook is the smartphone app with the highest audience reach in the United States, as the social networking app was accessed by nearly 80 percent of the mobile audience in the country. Facebook Messenger has the second highest reach in the country, while YouTube ranked third. Some of the everyday activities Americans use Facebook for include discovering new interests, expressing their creativity and relaxing. 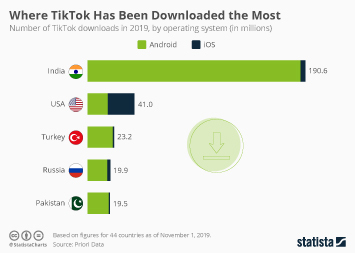 Number of apps available in Google Play Store as of Q3 2018 2.1m Number of apps available in the Apple App Store as of Q3 2018 2m Number of apps available in Windows Store as of Q3 2018 669,000 Number of cumulative downloads from Apple App Store as of June 2017 180bn Most-downloaded Android app in the United States in March 2019 Facebook Messenger Most-downloaded iPhone app in the United States in March 2019 Roller Splat! More interesting topics from the industry "Mobile Internet & Apps"